How Much Can You Pull with a Chevy Silverado? How much can the Chevy Silverado tow? Now, those are obviously some massive ranges right there. So, what accounts for those big gaps in the tow ratings? Well, that’s exactly what we are about to dive into farther down in the article. Keep reading to find out. A lot goes into figuring out a truck’s official tow rating. Even trucks with the exact same model, cab configuration, and trim level can come with different tow ratings. Factors such as 4WD, axle ratios, and even various options fitted to the truck can all impact that truck’s rating. That means the only way to know the actual rating of the truck you are looking at is to locate the sticker on the driver’s door jamb that indicates the weight limits for that truck. Even with all of the elements involved, carmakers usually give you a pretty good breakdown of what you can expect on their websites. And no, I am not talking about the big number splashed across the Silverado web page. Sure, that can be the correct number for a perfectly-equipped truck (usually the one with the largest engine as well as the special “Max Trailering” package), but most models you find will fall somewhere lower than that. To give you an idea of what you can expect, here are the tow rating ranges for each model of Silverado explained. While we will be discussing the configurations of the trucks on either end of the scale, you should know that there are many – too many to discuss, in fact – other configurations in the middle that provide all sorts of tow ratings in between the two extremes. Not surprisingly, the half-ton Silverado 1500 offers the lowest to rating possible on a Silverado. Still, you have to be impressed with the ratings for these modern trucks. It wasn’t too long ago that it was unheard of for any 1500 truck to tow 10,000 pounds. And the fact that many 1500s are rated to tow even more than their HD counterparts is very interesting. One of the main factors affecting the Silverado 1500’s tow rating is the engine. Currently, this model is made with 4 different engines: a new 2.7-liter turbo 4-cylinder, a 4.6-liter V6, a 5.3-liter V8, and the top-dog 6.2-liter V8. As you would expect, there is a big difference in the power and torque put out by these engines. And Chevy has been promising the arrival of a new 3-liter Duramax diesel for the 1500 later this year, which should be a great tow engine. On the low end, the Silverado is rated to tow nearly half as much as the strongest truck available. Configured with the new four-cylinder, 2.7-liter turbo engine, the double-cab, 4X4 Silverado is rated to tow just 6,700 lbs. Still, for many, many half-ton truck owners, that is more than enough. 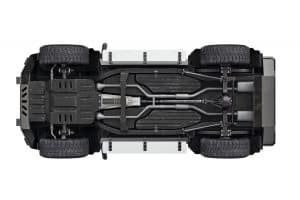 On the other end of the scale, Silverados equipped with the big-daddy 6.2-liter V8 and the Max Trailering Package can tow the maximum 12,200 lbs load. According to the Chevrolet towing guide, those trucks only come with the double-cab configuration as well as 4-wheel-drive and a standard-length box. Now that we are to the “HD,” or heavy-duty trucks, we must draw a distinction between conventional towing and 5th-wheel towing. The same truck is given two different tow ratings based on the style of towing it will be doing. Because 5th-wheel hitches are easier for the truck to handle, those trailers are given a higher tow rating. Meanwhile, the conventional tow rating is often a couple of thousand pounds lower. As for engines, the HD trucks only get two choices. Cheaper and less powerful is the 6.0-liter Vortec V8. With 360 horsepower and 380 lb-ft of torque on tap, this engine is no slouch, but it simply cannot pull like the other available engine. We are talking, of course, about the big 6.6-liter Duramax diesel. Pumping out an impressive 445 horsepower and an insane 910 lb-ft of torque from just 1600 rpm, there isn’t much this diesel can’t pull. It should come as no surprise, then to learn which engine gives the 2500 its lowest tow rating. Equipped with the gas 6.0-liter Vortec V8, a long-bed, Crew-Cab 4X4 Silverado 2500HD with the long box is rated to conventionally tow just 9,400 lbs. While that’s still quite a large load to pull, it is impossible not to notice that this figure is well under the maximum rating for the 1500. On the other hand, and Chevy claims that a properly-equipped Silverado 2500HD can tow up to 18,100 lbs. Interestingly, that exact figure isn’t provided on the manufacturer’s towing guide for 2019. To find out exactly what is going on, I referred to the Goodman Automotive blog, which gives us the details on the 2018 model. According to the blog, when your 2500HD is equipped with the 6-liter gas engine, the 5th-wheel tow rating is a measly 14,500 lbs. Opt for the 6.6-liter diesel, however, and your rating jumps up to the advertised 18,100 lbs. So evidently it all comes down to engine power. As you would expect, the top-dog 3500HD can tow the biggest load of all the Silverados. What might have caught you off guard, however, is the fact that the lowest-possible rating is lower than that of the 2500HD. It appears that the extra weight on the 3500 takes its toll. So, how do you find a 3500HD that is rated to tow less than 9,000 lbs? Prepare to be even more surprised – it’s on a dually version. That’s right, find yourself a long-box 3500HD dually with the 6-liter V8 and the 3.73 rear axle ratio, and you are limited to just 8,800 lbs of towing. On the other end of the spectrum, a properly-equipped diesel 3500HD configured with the long box, 2WD, and dual rear wheels can pull a 23,300-lb 5th-wheel or gooseneck trailer. Now that’s some serious weight! Can a Chevy Silverado Tow a Travel Trailer? Yes, any Silverado is perfectly capable of towing a travel trailer. 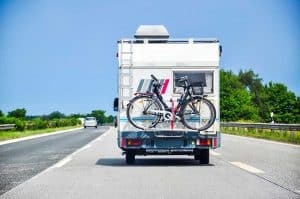 That’s because travel trailers come in a wide range of weights, including many trailers that weigh well under the minimum tow rating of the Chevy Silverado. Heck, most crossover SUVs can even tow some of the lighter travel trailers on the market today. But let’s talk about the average travel trailer, not those itty-bitty ones. After all, few people buy a full-size truck to tow a 1600-lb trailer. According to Camper Report, the average travel trailer weighs 5,200 lbs. That means, that even with some cargo and water on board, the four-cylinder Silverado 1500 is up to the task. Now, if you are looking to tow a slightly larger trailer, you might need to look at getting a more powerful version of the 1500. And to securely tow some of the largest trailers out there, you should consider the 2500HD and the 3500HD, which offer stouter frames and larger brakes in addition to more powerful engine options. Many owners who have towed with both the half-ton and the HD trucks report being much happier with the heavy-duty trucks, which tend to reduce the “floatiness” many half-ton trucks experience under load. Can a Chevy Silverado Tow a 5th Wheel? Okay, so travel trailers are no sweat – find a trailer, and there is likely a version of the Silverado that can handle it. But 5th wheels are another beast entirely – are these trucks up to the task? To answer that question, we first need to know just how much your average 5th-wheel trailer weighs. As with any trailer category, there is a wide range of weights when it comes to 5th wheels, but the average is between 12,000 and 15,000 lbs. As you know if you read our previous article on the subject, it certainly is possible for a Silverado 1500 to pull some 5th-wheel trailers. While the average weight is a bit high for the half-ton trucks, many 5th-wheel trailers offer a dry weight under 10,000 lbs. So, clearly, it is feasible for any model of Silverado to pull a 5th wheel, as long as it is properly equipped and the trailer fits the truck. One other important factor to consider with a 5th wheel is payload. These trailers tend to have high hitch weights, so make sure your truck is up to the challenge. And, once again, for more information on this issue, consult our half-ton 5th wheel article. So, there you have it. The Chevy Silverado comes in a wide variety of styles with many different engine choices. And all of those factors have an impact on just how much each individual truck can tow. While some owners are disappointed when they find out their truck isn’t rated for the advertised maximum tow rating, it’s really not that bad of a thing. In fact, it’s that flexibility that makes the Silverado such a popular model. From the most basic of needs like a bed for Ikea runs to the gargantuan dually trucks pulling 20,000-lb 5th wheels across the country, the Silverado has your towing needs covered. And for more information on what exactly these tow ratings mean to you, check out our comprehensive towing capacity and trailer weight article. Don’t have a Chevy Silverado yet? Wondering which pickup truck to get so you can tow a sweet travel trailer or 5th wheel with? We have more guides that you might find interesting. 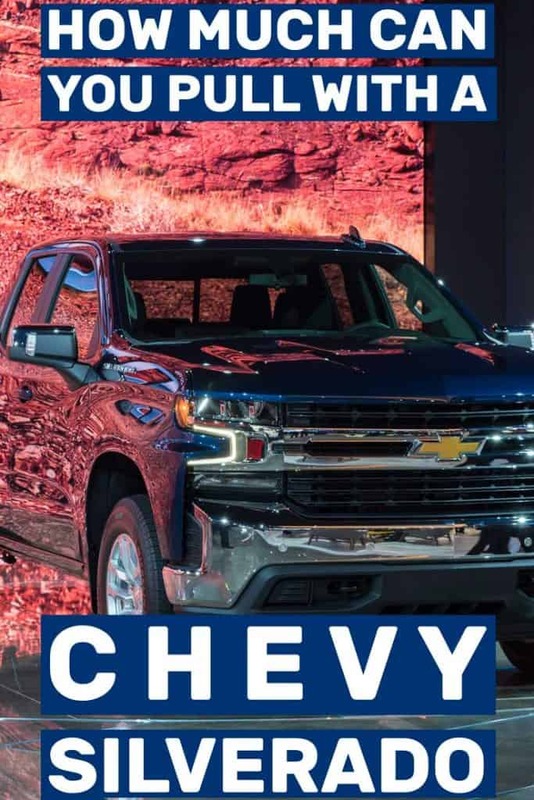 First, for the Silverado itself, check out How Much Does A 2019 Chevy Silverado Actually Cost? If you’re wondering whether to get a Silverado or a Ford F-150, then you have to read this post too –How Big A Travel Trailer Can An F-150 Pull? And make sure to check out our guide for buying a used pickup truck too. Drive safely and enjoy the road! Next PostCan You Tow a 5th Wheel with a Short-Bed Truck?